There hasn’t been too much information flowing yet from the spring practices taking place across the Big 12. Lots of programs are fairly quiet either because they are looking for new QBs and key players, they are naturally secretive by nature, or it’s simply early and they expect things to shake out over the course of spring and then fall. The Sooners are retooling their defense in a major way, dropping the two-gapping approach from Mike Stoops and getting more aggressive across the front but doing so at a time when they are short on difference-making DTs. It’s possible, likely even, that the big DL OU has been bringing in over the last few years will thrive in this more conventional approach. The Sooners are also going to be movement oriented and look to cause confusion and penetration by shifting into four-man fronts from a three-man base. With an emphasis on movement you can get away with being lighter and quicker at the “DE” spots but you need that nose to be a guy that can command a double or else you run the risk of watching your LBs get trampled on inside runs. But interspersed with all of their young tweeners and edge players on campus the Sooners do have RS senior Neville Gallimore poised to anchor the front. He’s been solid over the last couple of years and it’ll be interesting to see what he can do when freed up to attack spots rather than trying to shove guys into gaps. I have Tyreece Lott in that boundary DE spot because I don’t know who else the Sooners have that is worth playing as a gap-shooting player. There’s Dillon Faamatu who’s never impressed much and then stocky Marquise Overton. Mann seems likely to earn a spot and benefit from the changes while I feel confident that Perkins will stay outside as their most dangerous pass-rusher. 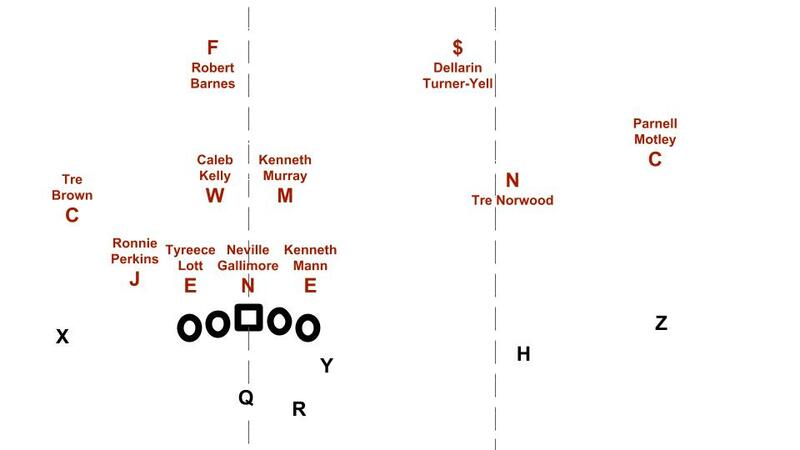 The secondary will play some different quarters coverages and probably lean towards the cover downs they used last year when Brenan Radley-Hiles was at nickel but Norwood seems to be the best bet there after his performance at SS last year playing behind Caleb Kelly. There’s a lot of question marks on this team in general and less surety that they’ll find good answers on defense. If Gallimore can command doubles and they can get Tre Brown, one of their savvier guys, in position to make some plays then things could come together. Overall coverage is iffy and there’s certainly concern that moving around up front will just serve to confuse their own players and result in Kelly and Murray yielding creases in confusion. This secondary can’t really afford to lend too much support against the run if they don’t lock it down up front. Everyone is currently falling into the classic trap of discussing how Iowa State will replicate their previous formula now that Hakeem Butler and David Montgomery are gone. They aren’t going to replicate it, they’re going to find some different tactics. The OL essentially has five returning starters so they’re going to be a pretty solid unit. When you have that kind of experience up front you tend to be pretty effective, especially in pass pro, just because guys know how to block different looks and help each other. Iowa State had a pretty good OL in Paul Rhoads’ last year because they’d hired Mark Mangino before the previous and had a senior-laden group by 2015 (even though Mangino was fired or rage quit during the season). That group just knew what they were doing after having two offseasons of high quality coaching and they put freshman Mike Warren at 1300 yards. I think the concerns about their run game are pretty overblown. They have a ton of solid TEs, this uber-experienced OL, pump fake Purdy, and then a few strong RBs still round besides the two really talented incoming freshmen. So then the question is just whether they’re going to be able to generate explosive plays in the passing game with pump fake Purdy throwing to speedy guys like Deshaunte Jones and Tarique Milton. They’ve also got Josh Johnson emerging, which 247’s site reported was the best route runner on the team and I identified off his HS film as having potential there. I think now he’ll probably play outside and run into vacated areas after Milton and Jones have run clear out verticals from the slot. Anyways, Purdy excels at lobbing deep throws and leading receivers so it’s not hard to imagine the Cyclones finding some good tactics. It’s just not going to be quite the same as 2018 where it was all about moving Butler around to chuck it deep to him. They have little fast guys and then this chain-moving quick target out there now to play off the run game. They have all the infrastructure and it’s probably even better than it was a year ago even without David Montgomery’s insane tackle-breaking. It’s just a matter of figuring out what route combos and formations to use to best set up their WRs to go dominate 1-on-1 matchups, ensuring and finding the matchups is the harder part and I think they’ll get that job done with a veteran OL and pump fake. He redshirted last year and is now getting a lot of snaps in spring with a chance to win the starting job. I’m still betting on Parker Workman winning the spot opposite him but they have a few decent options, the main challenge is just making sure they have at least one guy that can get consistent pressure. They’ve got both Jeff Gladney and Julius Lewis back at corner which makes life easier on the back end for Innis Gaines and a young cast at safety. Gaines is out right now so they’re training up some of their younger guys that saw a little action a year ago, but you really just don’t want to bet against Gary Patterson here. If they have impact DL and can cover at corner then he’ll figure the rest out without difficulty. The most interesting question is at QB, where there’s buzz around Alex Delton and then young Justin Rogers and Max Duggan getting early enrollee snaps. This team is a game manager away from being a 10-win team so I think that should inform QB predictions in Fort Worth. Collins, who’s out for the spring, started multiple games last year. Rogers has barely been healthy enough to play football the last few years since destroying his knee in HS and Duggan is a big time prospect who needs to figure out the college game. Alex Delton is the only guy other than Collins with experience and knowhow at leading a college offense and he’s terrible. Mike Collins: Solid passer, blooded in the Big 12, would benefit from playing with a TE though of which the Frogs have a few elder options. Justin Rogers: Electric athlete before he destroyed his knee, strong arm, but has barely played football and had drop foot as recently as the bowl game where the Frogs were left to trot out Grayson Muehlstein and watch him go 7-20 with 27 yards and four INTs. Max Duggan: Super athletic and strong-armed Iowan kid who just arrived to campus as an early enrollee and needs to adjust to the speed and complexity of the college game while scrapping for snaps against Rogers and Delton in the short-term and then Collins before the season. Baylor seems to be evolving into something of a “downhill run game from the spread plus play-action pass game” style team. The Oklahoma Sooners made that look so cool last year when they were destroying everything in their path. Texas and Iowa State were already playing that style and both are replacing big, mobile targets with smaller speed guys. You can reasonably expect they’ll both be looking to land some vertical shots next season. Texas Tech and West Virginia are also on that path and Kansas State never wasn’t. What about the new defensive coach at OU? They should already have an idea from watching the other side of the field at practice, haha. I actually think Grinch gets it, I just don’t know if he can do it or not. May want to consider Chanse Sylvie in the starting lineup for OU at safety also. He’s been hurt but he may finally be back to full speed. I think you’re probably right about Lott but I also wouldn’t be surprised to see J. Kelley get a role on the line. He’s very athletic as well and Grinch is no longer requiring the DL to pack on unneeded pounds so he’ll only be more athletic. Isaiah Thomas could emerge down the line too. Wouldn’t be shocked to see Sylvie or Kelley, those spots are surely open for the taking. do you listen to Chris Simms podcast? His current one is “Chris Simms Unbuttoned” before that it was “Simms and Lefkoe.” He gives a ton of great insight into football but mostly sticks to NFL talk. He still gives a lot of great info though. I don’t, I’m intrigued though.